What is thermoelectric modules ? No.6 "Don't underestimate Thermal Resistance." It has been a bit hard for me to find a new "story" for the "Special" column in the home page, but this time, I will try to write about "thermal resistance"(*1), you shouldn't underestimate when you use thermoelectric cooler(TEC). How much of the real performance of a TEC you can actually use ? Thermoelectric cooler is a heat pump, absorbing heat from one side and dissipating heat from another, and a temperature gradient exists as shown in Fig. 1. You can see a big ΔT loss from what the thermoelectric material can inherently create. 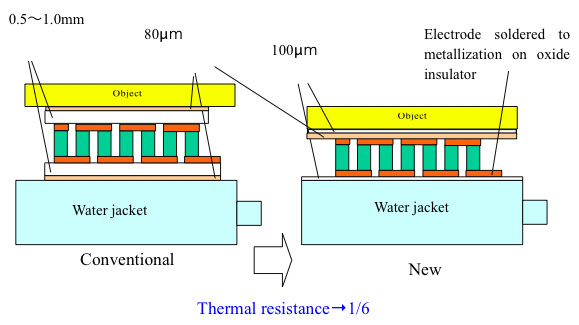 The significantly big thermal resistances created at two interfaces: the side of heat absorption from cooling object and the side of heat dissipation to heat sink, cut ΔT from what obtained with no thermal resistance at these interfaces. Eventually, actual ΔT becomes significantly smaller than the ΔT between the element junctions. Efforts to minimize these thermal resistances at interfaces have played a big role in the development history of thermoelectric coolers. Meanwhile, in the interfaces, there are copper electrode, ceramics, grease and air. 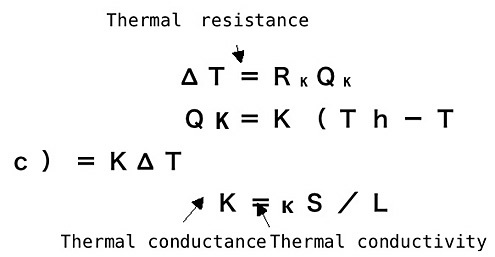 The thermal conductivities of these interface materials are shown in Table 1. Among these figures, we see very small thermal conductivity(very large thermal resistivity) of thermoelement, by which we can get large temperature difference in the thermoelectric cooler. And, from Table 1, we also find the extremely small thermal conductivity(large thermal resistivity) of air. From this reason, we use grease to fill the air gap in the interface. But, greases are basically made of organic substances, so thermal resistivity of greases range from 10 times(ZnO or alumina powder added) to 100 times(grease without good thermal conductivity additive like vacuum grease) of that of alumina. Roughly talking, thermal conductivity of heat dissipation side is three times larger than that of heat absorption side*2. So, effort should be made to minimize the thermal resistanse of the heat dissipation side. It is said the company first mass produced TECs with alumina ceramics, used in today's TECs for the purpose of electric insulation and heat exchanging plate, was Melcor, U.S.A.. As alumina had the best cost/performance as the pad of TECs, it has become the standard pad material of today's TECs. Aluminum nitride(AlN) has become a candidate pad material recently, but it's too expensive to be widely used. But, AlN is still an attractive material with its' 10-fold superiority of thermal conductivity than alumina. Table 2 shows attractive materials and substances to reduce thermal resistance. Among them, heat pipes, the component having different heat conduction physics, not utilizing solid heat conduction but utilizing latent heat of liquid vapor and its' near sound velocity to move, have 10 times larger thermal conductivity of diamond, or is 100 times thermally conductive than copper. This performance is far beyond other heat conductive materials. As you know heat pipes are widely used from its' special characteristics that they can dissipate heat far from the heat source. However, when you use a plate-like heat pipe for a TEC instead of ceramics, it has a great effect in homogenizing temperature to the horizontal direction of the heat-pipe plate, but has no heat transfer improvement to the vertical direction. So, heat pipes can be applied with TECs as a good tool to instantly transfer dissipated heat from TECs to quite a distant location of heat dissipation. Materials having high heat conduction performance both for horizontal/vertical directions are diamond and cubic boron nitride('CBN). But the material having potential to be used as the pads of TECs may be diamond like carbon(DLC) if we will be able to economically make a thick DLC plate in future. Because, DLC has far better thermal conductivity than copper, and the source materials are cheap, benzene or methane gases. Table 2 Good thermal-conductive material, etc. In contrast, Table 3 shows materials having very small thermal conductivity. Urethane foam especially has as small thermal conductivity as air, so it is used as a thermal insulator in thermoelectric cooling system to minimize incoming heat from environment. In order to reduce the big thermal resistance at heat dissipation side, direct bonding of thermoelectric elements to the hot-side heat exchanger is a very attractive method. KELK Ltd. has adopted the structure in Fig.2, and has succeeded in making the small and highly efficient equipment for semiconductor process. The structure reduced thermal resistance to 1/6, which has reduced the equipment size to 1/5 and has increased electric power efficiency by 30% compared to a compressor-type counterpart.